Earlier this month, the Nanuet Fire Engine Company was saddened by the passing of Ex-President Greg Tobin. 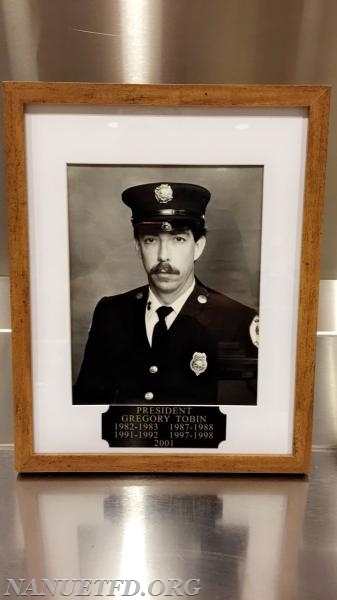 Greg was born in Brooklyn, NY to the late Gerard and Lillian Tobin. Greg was a retired police officer of the Clarkstown Police Department. He was also a 44 year life member of the Nanuet Fire Engine Co. and served many terms as President. He had a passion for fishing, golfing, and righting wrongs. He lit up a room with a booming voice and infectious laugh. Also, and more importantly, he was a tremendous advocate for wounded warriors and touched the hearts of many soldiers and their families especially the 75th Ranger Regiment. He helped so many along the way. Greg will continue to be in our hearts as a loving husband, father, pop pop, brother, uncle, and cousin; as well as a loving friend to all. Greg is survived by his loving wife of 33 years, Debra (Morina); his two children: Patrick (Carolyn) Tobin and Jessica (Michael) Pata; four grandchildren: Greyson, Parker, Hunter and Gianni; and by his siblings: Carol (Edwin) Connelly; Gerard (Mary Ann) Tobin, and John (Paula) Tobin and Mike Spelman; his mother-in-law Gloria Morina, sisters-in-law Cheryl, Susan, and Lisa; and many nieces and nephews who he deeply cherished.